Lagos is a popular holiday destination that provides its visitors with fantastic beaches, historic sights and a delightful city centre, full of open air cafes and restaurants. 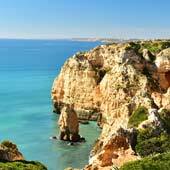 Lagos is the largest city of the region and is ideally situated as a base from which to explore the fascinating Western Algarve. As Lagos is a major city, there are good public transport links to the outlying towns and it is possible to fully discover the region without the use of a rental car. This guide will detail the most popular day trips from Lagos, which are ideal for the independent tourist who wishes to experience more than just beaches during their holiday. Silves is an ancient fortified town, which during the Moorish era (9-12th century) was the capital of the Algarve, being a major port and trading town. Today Silves is a sleepy and unhurried town, but remnants of the once importance are still visible throughout the town. 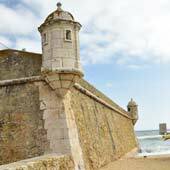 The skyline is dominated by the massive red brick castle, the fortified city gate has been integrated into the main square, and the slowing flowing Arade River provides passage for boat tours from Portimão. Silves is a delightful mixture of historic monuments, cobbled streets and traditional buildings that boast the unmistakable charm of southern Portugal. Silves is regarded as the best non-coastal town of the Algarve, and is small enough that it can be easily explored as a day trip. 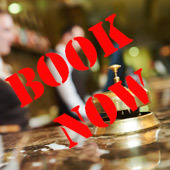 The Algarve regional train connects Lagos to Silves (40km, €2.90 35minutes) but there are limited daily services, so pick up a copy of the latest timetable from Lagos train station before the day trip. There are no direct buses from Lagos to Silves, and a connection is required in Portimão. Silves train station located 1.5km from the historic centre and the walk is not scenic, as it follows a busy road and is down a steep hill. For a full guide to Silves please click here. Sagres is the most westerly town of the Algarve and is in a region of massive cliffs, vast beaches and raging seas. These powerful seas attracted experienced surfers and Sagres has developed into a hub for surfing, with numerous surf schools, beach hangouts and laid back bars. The town may have a ramshackle appearance but spend any time here and the unassuming, trendy vibe will become apparent. For a day trip Sagres has a working fishing harbour, three great beaches, numerous hiking trails and a unique fort. The Fortaleza de Sagres covers the entire southern headland, with only the northern side conventionally defended with a wall, the three remaining sides are protected by the sheers cliffs. Inside, the fort could be described as sparse but as with everything in Sagres the dramatic scenery is the main attraction. The Cabo de Sao Vicente is the southwestern tip of mainland Europe and is a barren landscape of massive cliffs, pounding waves and a ceaseless wind. Up until the 14th century the headland was believed to be the end of the known world and the bleak landscape only enhances this once belief. The main attraction of the Cabo de Sao Vicente is the distinctive lighthouse that has the second most powerful beam in Europe, and the light is visible for 50km. Both Sagres and Cabo de Sao Vicente can be combined to form an enjoyable day trip from Lagos. There is a regular bus service from Lagos to Sagres, but only two bus services Monday to Friday that travel all the way to Cabo de Sao Vicente. 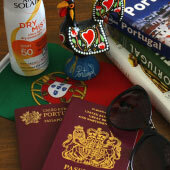 For a guide to visiting Sagres as a day trip please click here. 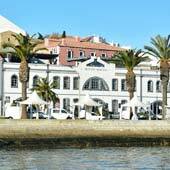 Portimão and Praia da Rocha are two vastly differing towns but their closeness means that they can be combined into an alternative day trip. Praia da Rocha is loud, brash and lively, while Portimão is historic, residential and has the best shopping in the western Algarve. Praia da Rocha is positioned on a beautiful beach, but the modern tourist developments of mega hotels and towering apartments have done nothing to enhance the natural beauty of area. On a positive, the main street of Praia da Rocha can be great fun with themed bars, happy hour promotions and a constant holiday atmosphere. Portimão is north of Praia da Rocha and was once a major port, but today the focus is on the large marinas. Portimão has some of the best shopping in the western Algarve and the city centre is filled with pedestrianised shopping streets and pretty plazas. For the day trip, there is an enjoyable walk from Portimão harbour, around the exclusive section Praia da Rocha and then along the coastline to the beach of Praia de Vui, where there is a bus back to Portimão. There are both bus and train services from Lagos to Portimão and it is a short taxi ride to Praia da Rocha from either of the stations. The coastline to the west of Lagos is lined with small and delightful resort towns, each one with its own distinct character and appeal. This day trip can make for a good bike ride and bikes can be hired from Lagos for €13-15 per day. The cycle route follows quiet back roads but be warned there are some very steep hills. 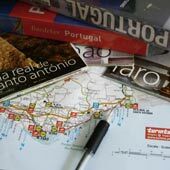 It is possible to visit each of the towns via public transport, as there are good bus services from Lagos to Luz, Burgau and Salema but there are limited services between each of the towns. Luz is a peaceful town that is positioned on wide sandy beach and stands in the shadow of the huge and distinctive Rocha Negra cliffs. The town has a welcoming atmosphere where a large expat (English) community relax in the numerous beachfront cafes. There is a pleasant promenade which follows the beach front and leads to the whitewashed church and town centre. The walk to the summit of the Rocha Negra cliffs provides a short but challenging hike which rewards visitors with amazing panoramic views. 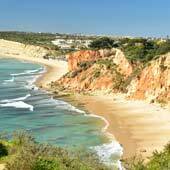 Further along the coast is the pretty fishing village of Burgau, with a small sandy bay, cobbled streets and traditional fishermen’s houses. 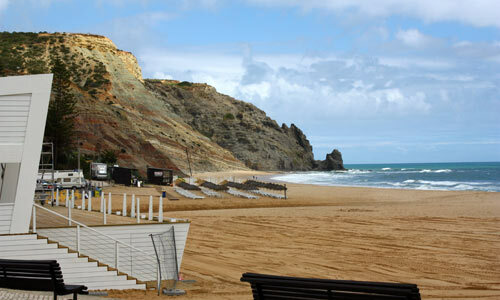 Burgau maybe small but it is delightful place to visit. The final village of the tour is Salema, which is situated in a narrow valley that opens out onto a pretty beach, where fishing boats are still pulled onto the sands. The village is lined with traditional fishing houses and the peaceful ambience is far removed from the hectic Algarve. Vila do Bispo coastline extends along the western edge of the Algarve, and this remote region offers unspoilt beaches, amazing hiking routes and dramatic scenery. Much of the coastline is protected from tourist development as it lies within the Sudoeste Alentejano e Costa Vicentina nature park and this has helped maintain the idyllic natural setting. 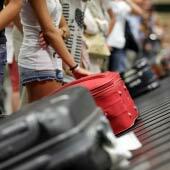 To discover the region a rental car is required as there almost no public transport. 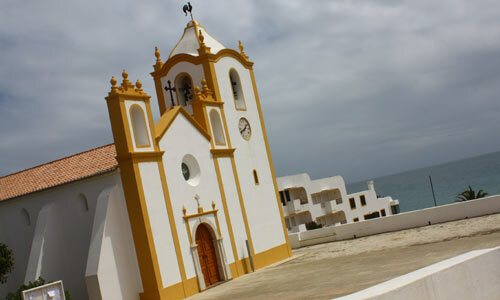 The main town of the region, Vila do Bispo, has a laid back and relaxed ambience that is very hospitable and welcoming.